The movement of the planets and the most significant aspects in 2019 year. Mercury, Venus, Mars, Jupiter and Saturn in 2019 year - periods of retrograde, configuration, movement on the signs of the zodiac. 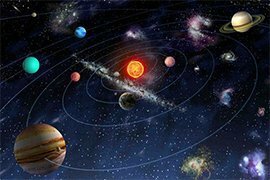 This astrological service allows you to calculate the current position of the planets of the solar system. Planets are the most massive celestial bodies orbiting the star. From the Greek language, "planet" is translated as "wanderer", or "wandering". The planets of the solar system move in elliptical orbits around the Sun. We all feel to ourselves, to varying degrees, changes that are reflected by aspects of the planets of our solar system. On the life of each individual, this is reflected in different ways. The thing is that all of us, born at different times, have different vibrations and different energy charges. Therefore, some phenomena with us resonate, and some do not. In order to understand how the configurations of the planets will affect you personally, you also need to study their effect on the elements of your individual birth horoscope. Retrograde means "moving backwards." The reason for the retrograde motion is that the terrestrial observer and the planet move with different velocities around the Sun. Everyone knows the situation: the passenger on the train looks at another train going in the opposite direction, but more slowly, and it seems to him that that train is going back. The mechanism of the retrograde motion of planets acts in a similar manner. Accounting for periods of retrograde motion of planets can make life much easier, if you do not schedule serious cases for this time.